You may remember from high school or college chemistry that temperature affects the rate of chemical reactions. A reaction between two molecules can only occur if those two molecules collide with sufficient energy (collision theory). Heating causes molecules to gain energy, increasing their velocity (kinetic theory). A higher velocity increases the probability of two molecules meeting thus increases the reaction rate. In the oceans, temperature decreases with increasing depth with the deep sea usually around 3-4˚C. Whereas this basic pattern holds, regional differences in current structure lead to deviations in the exact temperature/depth profile. For example, the deep Mediterranean is warmer (13˚C between 600-4000m) and deep water near Antarctica is colder (-1.9˚C. A typical profile (image from Windows to the Universe) is shown below. The metabolism of an organism is the sum of all chemical reactions that maintain the cells (e.g. 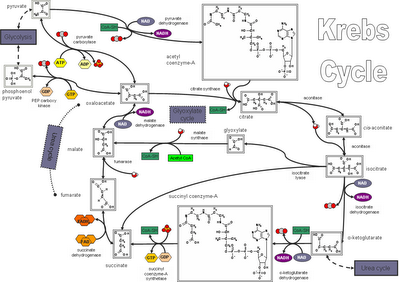 the Kreb’s Cycle below, image from Steve’s Place). Metabolism can be further divided into catabolism, the breakdown of molecules to gain energy, and anabolism, the synthesis of new compounds for the cells. Putting the pieces together, we would predict that metabolism of deep-sea organisms would be lower due to the lower temperatures and decrease with increasing depth ceteris paribus. Various researchers have documented these findings over the last 40 years. A note of caution that several other factors, including an organism’s size, affect metabolic rate as well. It follows that if metabolism is slowed then other processes will be influenced as well. Lowered temperatures lead also to slower growth rates and reproduction rates. Longer lifespan also seem to correlate with colder temperatures although whether this reflects physiological (i.e. internal) or ecological (i.e. external) processes is still being investigated. If all the processes of individual, e.g. behavior, reproduction, lifespan, growth, movement, are reduced because of cold temperatures then the processes of entire population of organisms, e.g. population growth rate, should be reduced as well. We could even broaden this to community and ecosystem level processes. An interesting exception is hydrothermal vents where temperatures can be near 350˚C. Obviously high temperature would elicit the opposite patterns. This is one of the main reasons why any anthropogenic effect to the deep sea is likely to be detrimental. Deep-sea systems will be slow to recover. A sustainable deep-sea fishery is unobtainable because deep-sea fish are slow growing and long lived. Share the post "ARCHIVE: 25 Things You Should Know About the Deep Sea: #13 Extreme Temperatures Affect Biological Rates"
“Just as the scientific community was gaining confidence in Alvin’s ability to dive routinely and safely, disaster struck. At the end of its 1968 dive season, Alvin was in the process of being launched on dive 307 when suddenly its forward cables broke, dropping the submersible into the sea. Quick action saved the crew and passenger, but Alvin disappeared beneath the waves, falling 1,585 m to the ocean floor. There it remained until 1969 when a heroic salvage operation returned it to Woods Hole. As engineers accessed the damage done during her 10 months underwater a startling discovery was made (Jannasch and Wissen, 1970). Alvin broke surface again in September 1969 after resting almost one year on the ocean floor. In the excitement over her successful recovery, the oceanographers almost overlooked the striking outcome of Alvin degradation experiment: the food in the box lunch was practically untouched by decay, although containing the usual amount of bacteria. The broth, although being the most perishable material. was perfectly palatable. Four of us are living proof of this fact. The apples exhibited a pickled appearance. But the way the salt water had penetrated into the fruit tissue indicated that the membrane functions were hardly affected. Enzymes were still active, and the acidity of the fruit juice was not different from that of a fresh apple. The bread and meat appeared almost fresh except for being soaked with seawater. Thanks for the link to that online book, Andrew. Next Next post: This Christmas, make it "Moby Duck"